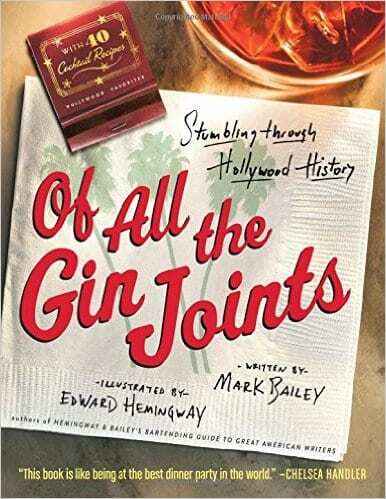 For a fun, read-out-loud anthology of celebrities and their drinking anecdotes, mixed with thumbnails on classic Hollywood watering holes from the venerable Musso & Frank to the singular Dan Tana’s, Of All the Gin Joints, by Mark Bailey with illustrations by Edward Hemingway, fits the bill. 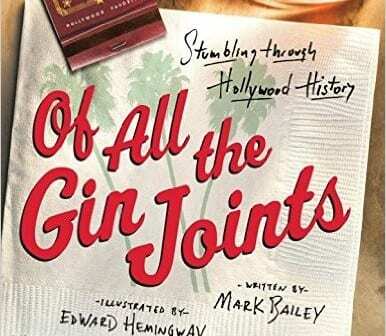 The book’s told with in extra dry humor with a twist of reverence for the days when there really was a “Martini shot” on every movie. There’s an outrageous tale of drinking buddies Frank Sinatra, Robert Mitchum and Lee Marvin having one too many and dragging Joe DiMaggio with them to kick down Marilyn Monroe’s door. Thumbnail bios of the stars are mixed with their drink recipes. Some drinks most people won’t go near, like the dueling boilermaker recipes of Richard Burton and Coach Buttermaker (Walter Matthau’s character in The Bad News Bears). But others are for staples like the Margarita. 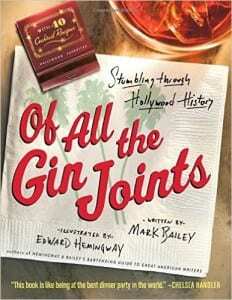 This comes with a tale of the genesis of the Margarita. It happened when John Wayne and his pals hanging out in Acapulco challenged the hostess, Margarita Sames, to come up with something interesting for the group. What could be better to recapture the feeling of summer.